Three and a half years ago I went into my doctor’s office for my annual checkup – as I had just moved to Houston and needed a PCP. I was describing my daily life and how I was anemic, had arthritis, zero energy, and just basically felt like crap all of the time. I was going home from work and falling asleep on the couch immediately. I described my other symptoms (lactose intolerance, etc…) and he suggested I get tested for celiac disease. I will tell you now (and thank Cthulhu I found a PCP willing to listen to me), I checked off TEN of those on this list, so we did the thing. Well wouldn’t you know it? Results were positive, and that means going gluten free. It’s been three and a half years, and I can tell you this: My energy is up, I’m not anemic anymore, I actually DON’T have bad arthritis, and I’ve been able to lose a ton of weight (well thanks to that plus not eating garbage and exercising). I have the energy TO EXERCISE. It’s awesome. Click the link above if you think you may have something similar, and always ask your doctor. 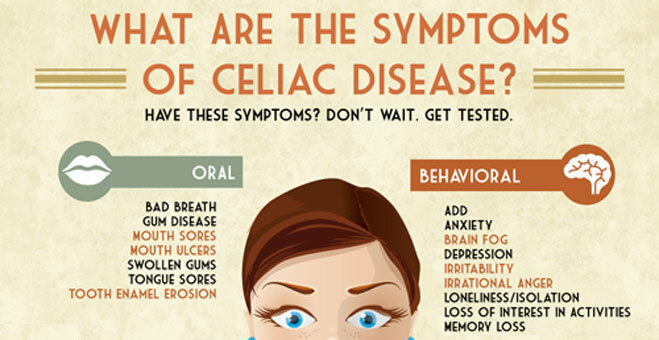 And for those of us who have celiac, just note: First-degree relatives (parents, siblings, children), whether or not experiencing symptoms, should always be screened, since there is a 1 in 10 risk of developing celiac disease. I am so glad I got a diagnosis, and I hope this helps others who may be suffering. I wish you all a positive, healthy 2019.